In the parable Jesus tells today, a fig tree fails to bear fruit. The owner wants to dig it up, but the gardener persuades him to keep it for another year, to nurture it and see if it can change. This is like our relationship with God – God is always looking to give us another chance to change and to bear fruit. Today is the anniversary of the day Saint Oscar Romero was shot and killed while saying Mass in El Salvador in 1980. He did not always look like he was on the path to martyrdom. He was made archbishop of San Salvador during a dictatorship because he was considered a safe bureaucrat. Instead he became a brave defender of the poor. He was changed by long nights spent listening to poor farm workers tell their stories, and by the murder of a close friend. These experiences brought him back to his roots amongst the poor in the countryside of El Salvador. Despite threats and violence against him, he stood faithfully beside those who had nothing. 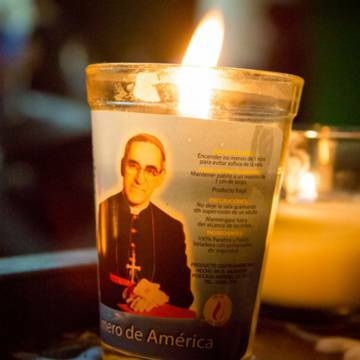 Saint Oscar Romero experienced profound change in his own life. He then taught: “We need constant conversion”. This is the call we hear in today’s gospel. Let us all examine the ways in which we need to change, to grow closer to those who are in need, in humble service. Defender of the Poor, Prophet of Peace, guide us and inspire us to work for justice and reconciliation with wisdom and compassion in witness to our faith in Jesus Christ. Reflect on some of Saint Oscar Romero’s most inspiring quotations in this PowerPoint reflection.